Antagonist Caleb Coffin—and what an antagonist he is—insists that two motives sway the human race, the love of gold and the love of praise. He attributes the latter primarily to the woman, who, though she sacrifices money, time, and strength, will not sacrifice her vanity, or love of being admired. The vicar’s daughter Philomel, whose profusion of golden locks still falls on her shoulders, is on a quest to keep the village school open. But Caleb challenges her motives and exposes the secret desires that drive her works of charity. And deep down she knows he’s right. Determined to prove him wrong, she takes on his brutal three-pronged challenge. Tensions rise, then Philomel does the unthinkable! From Laurel Kolar of Sacramento, California on 1/15/2019 . One of my Lamplighter favorites along with "The Kings Gold" and "The Secret Bridge." It has a lovely spiritual exhortation of doing what we do as unto the Lord, within a delightful story that draws the reader in from the start! 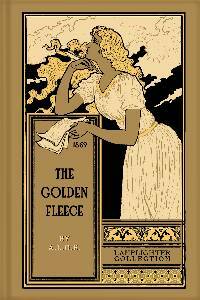 As an added bonus "The Golden Fleece" has the most beautiful cover art of all the Lamplighter books! From Anonymous of Capon Bridge, West Virginia on 9/5/2018 . The Golden Fleece is a really good book. Brilliant story and wonderful characters. The heroine's sacrifice is wonderful. From Stephanie Harvey of Lyndon, Kansas on 8/25/2018 .